The legislative action came just as hundreds of families, classic car enthusiasts, and history buffs prepared to visit Edwardsville, Glen Carbon, Troy, Collinsville and other Southwestern Illinois Communities as part of the annual Illinois Route 66 Blue Carpet Corridor celebration, June 9-10. 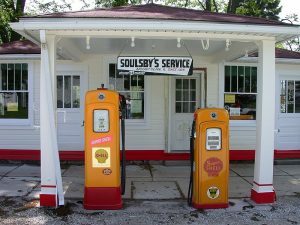 It also came just as the National Trust for Historic Preservation, June 26, named U.S. Route 66 to its annual list of the 11 Most Endangered Historic Places in America, and urged Congress to name it as a national historic trail. It was the second time Route 66 made the National Trust’s most-endangered list. A section of the highway made the list in 2012. National Historic Trails are designated by act of Congress to protect land or water trails with historic significance to the United States, under the auspices of the National Park Service. They are part of the National Trail system which also includes National Scenic Trails and National Recreation Trails. The park service generally maintains, and in some cases purchases, the trails and some surrounding land through partnerships with state or local entities. Nineteen National Historic Trails have so far been designated including the Pony Express route from Missouri to California; the Santa Fe Trail from Missouri to New Mexico; the El Camino Real spanning Louisiana, Texas, and New Mexico; Alaska’s Iditarod; and the route of Selma to Montgomery civil rights march in Alabama. 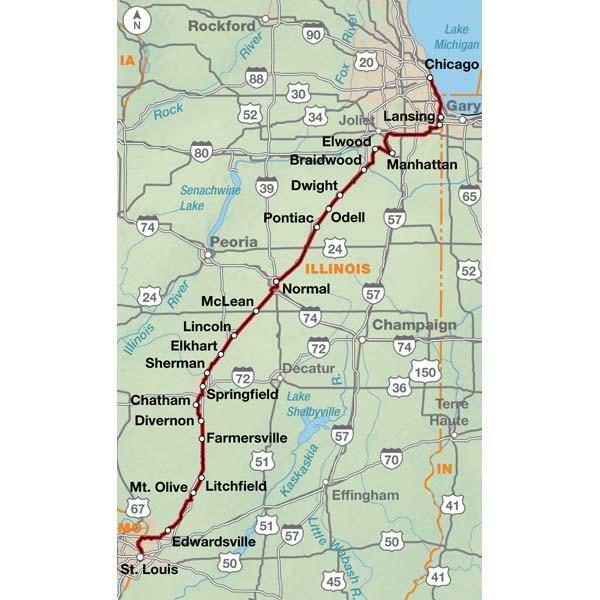 Presently, two such designated trails run through Illinois. The Lewis and Clark Trail extends from the Cahokia Courthouse in St. Clair County (by way of the Hartford Historic Site in Madison County) to the Pacific Coast in Oregon. The Mormon Pioneer Trail runs from Nauvoo to Salt Lake City. The Route 66 National Historic Trail Designation Act (H.R. 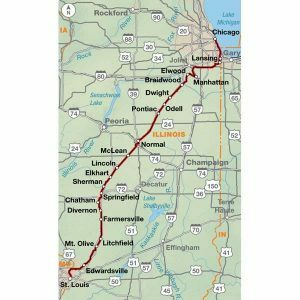 801), co-sponsored by Illinois 18th District U.S. Rep. Darin LaHood (R-Peoria), would amend the National Trails System Act to create a Route 66 National Historic Trail. Companion legislation, the Route 66 Centennial Commission Act (H.R. 66), cosponsored by Rep. LaHood and Illinois 13th District Rep. Rodney Davis (R-Ill.), would authorize commemoration of the 100th anniversary of U.S. Route 66 and the federal highway system in 2026. Direct the commission to host a conference on the U.S. Numbered Highway System, marking its 100-year anniversary. Direct the U.S. Department of Transportation, in consultation with governors of the eight states through which U.S. Route 66 passes, to develop a permanent plan for the preservation of the highway. Route 66 Museum in Litchfield. Illinois tourism leaders — among the nation’s most active boosters of Route 66 tourism — hope to host the conference. Moreover, they hope the proposed preservation plan will help ensure maintenance of the miles of U.S. Route 66 roadway, alternate routes and business loops which remain commonly-used arteries in Metro East. They also hope to find new life for the numerous roadside structure the highway spawned — now often vacant or in disrepair. Though authorized, planned and constructed by the federal government, federal highways — with exception of the Interstate Highway System — are generally maintained by state or local government without federal reimbursement. 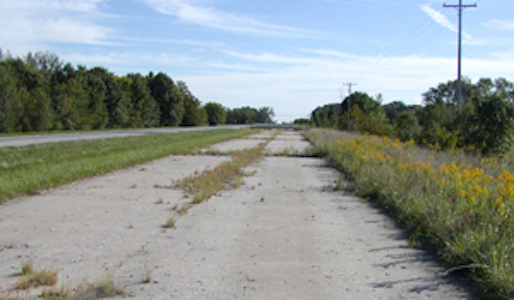 That can present a problem in cash-strapped Illinois and the economically downtrodden areas of Metro East, which may host more miles of current, past or alternate U.S. Route 66 roadway than any other similarly sized area in the nation. 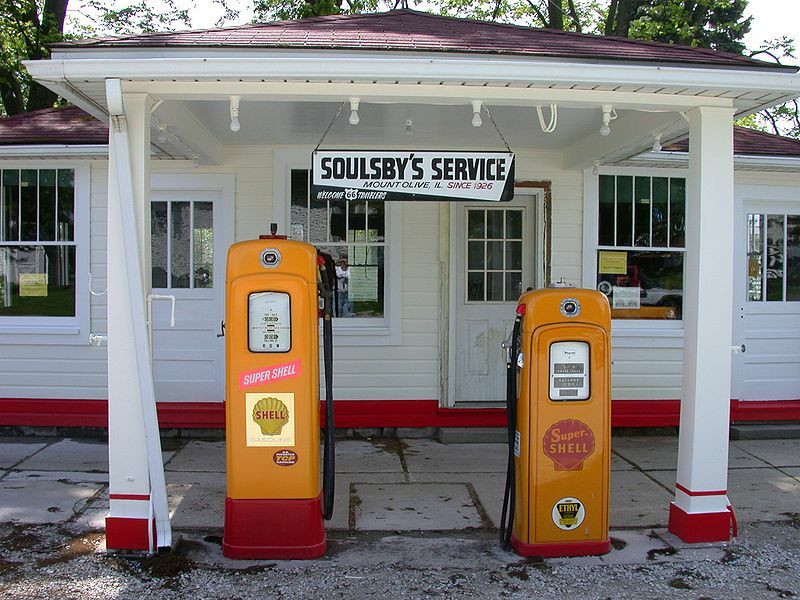 In Illinois, U.S. Route 66 initially coincided with already-established Ill. Route 4, which extended from East St. Louis to Chicago. The state highway generally followed the route of the Pontiac Trail; which had been blazed by Native Americans and later used by stage coaches. It generally ran close to the Chicago and Alton Railroad tracks. Originally, motorists on U.S. Route 66 entered Illinois from Missouri by crossing the Mississippi River on the McKinley Bridge to Venice. The highway then ran through Madison, joining the route of present-day IL Route 203 in Granite City, and proceeding north to Hamel. In 1951, the highway was rerouted over the new Veterans’ Memorial Bridge, through East St. Louis and Fairmont City. Over the following years, it would follow Ill. Route 157 and then Ill. Route 159 as those state highways were opened. Meanwhile, three alternate or business routes were designated. A U.S. Route 66 Bypass ran from Mitchell to Sunset Hills by of the now-closed Chain of Rocks Bridge. 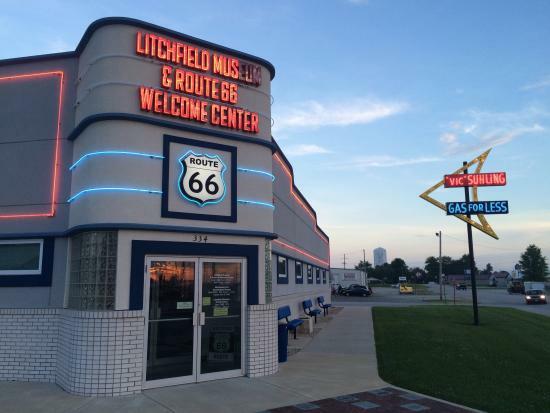 U.S. Route 66 Business once ran from Mitchell to East St. Louis. After the 1951 realignment, the old Venice to St. Louis route then became known as Optional U.S. Route 66. In the 1970, Interstate 55 was constructed to provide an alternative to U.S. Route 66 in Illinois. Much of U.S. Route 66 still runs nearby or coincides with I-55. The proposed new Route 66 National Historic Trail would include all the alignments of U.S. Route 66 in existence between 1926 and 1985, according to the legislation.